I cannot overstate the value of a good stake. I guess I’ve been watching too much on the Sci Fi channel, but the first thing that came to mind when I read “Staking” was vampires. Most of my plants turned out on the small side. The largest tomato plant I tied to a PVC pipe I hammered into the container, the other I tied with rope to the deck rails. The rest seem to be holding up on their own so far. I’ve heard lots of programs talking about using cages of some sort to hold tomato plants up. Maybe with some luck my plants next year will be large enough to try that out. 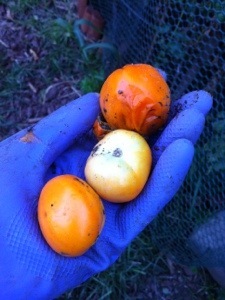 I have been picking tomatoes slowly but surely. So far the one and only Paul R tomato I picked was a nice size. It had a damaged spot but it was only a surface wound. 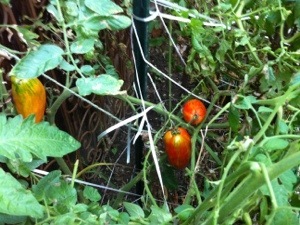 There’s still a few good sized ones in the process of ripening.